This eggplant salad is quite different than the western eggplant salad with the big, cooked purplish eggplants. These eggplants are the raw Thai eggplant the size of a golf ball with white and green stripes. Yum Makua or (aka Sah Bahkua) is a popular northern dish. Throughout the north, there are several variations of this dish. Some people prefer fresh chili; I like the flavor of dried roasted chili in this dish better. Some people like to add lemongrass; I find lemongrass overpowers other spices. 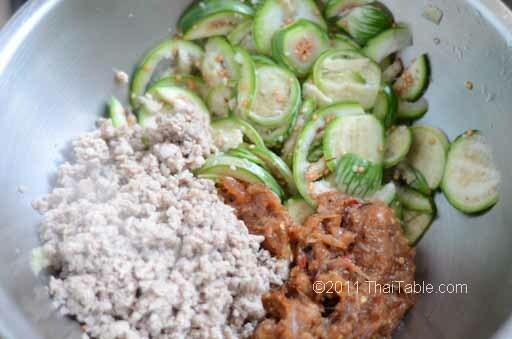 Some recipe calls for shrimp paste, some for dried bean paste (a northern specialty) instead. Some sprinkle crushed crispy pork rind. Some add fried garlic on top. I have tried a few and like this approach the best. It’s rather simple tasting where the flavor of this dish rests on the roasted garlic, shallot and pepper mixture. 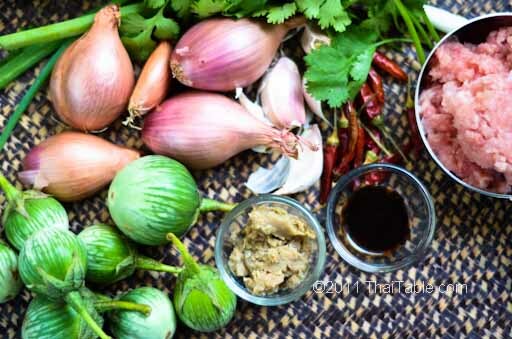 Of the 4 basic Thai flavors (sour, sweet, nutty/creamy and salty), salty is at play here. 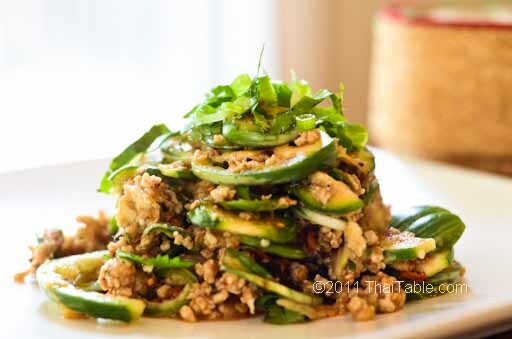 The kick of this dish is the contrast of spicy strong tasting pork mixture and the neutral raw taste of raw eggplant. Pickled fish or pla rah's saltiness varies from brand to brand. You may not need fish sauce if your pickled fish is quite salty. 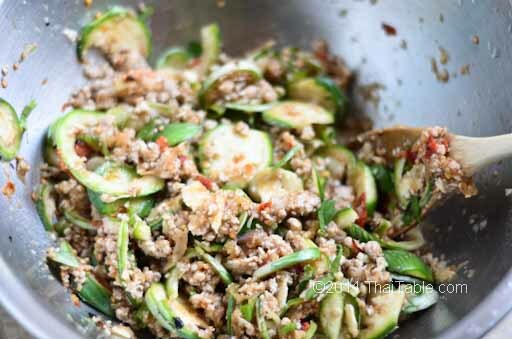 Taste the salad before adding fish sauce. With 10 chili peppers, this is pretty hot for me, but if you make it hotter, add more salty agent (pla rah or fish sauce) because, the hot tends to burn your taste buds. Hence, you need more seasonings. 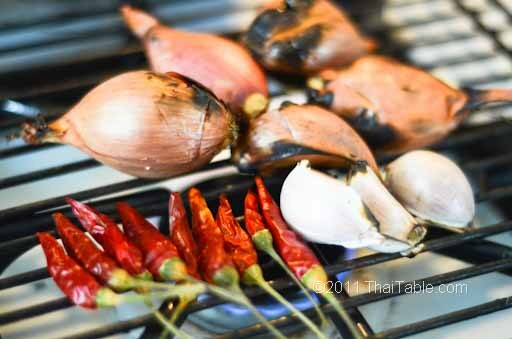 Grill over stove or roast in a pan the shallots, garlic and dried whole peppers. The shallots and garlic can go right in the center over the flame but keep the chili peppers on the farther side, they burn really fast. When ready, the chili peppers puff up and turn from red to brown. Take the chili peppers out and set aside. Shallots and garlic take about 5 minutes to cook directly on the flame (roasting in the pan will take longer.) They will be slightly charred on the outside but soft and cooked on the inside. When the charcoal stove was more common, the garlic and shallots are buried in the hot ashes below the fire. Remove the peel from roasted garlic and shallots. 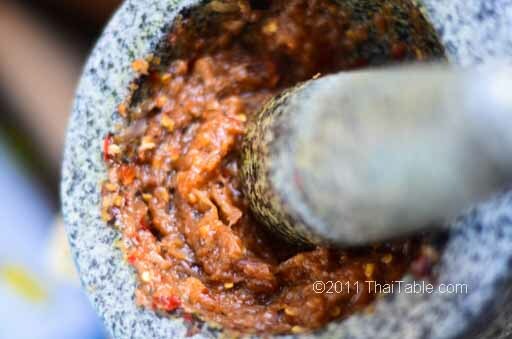 Pound garlic, shallots and chili peppers in a mortar until roughly ground. 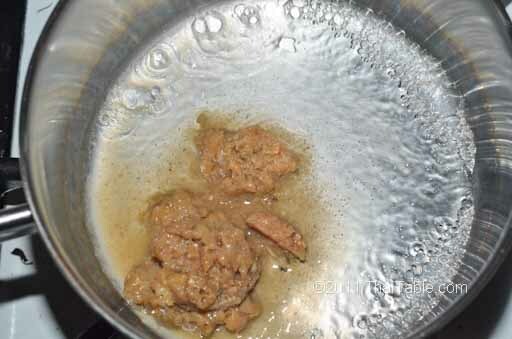 Add 2 tablespoons of water or just enough water to cover the bottom of the pot. Let the water boil. Add 1 tablespoon pickled fish to the pot. Bring it to a boil. Add the ground pork. Stir the pork in the sauce until it’s well cooked. Turn off the heat and set it aside. Slice eggplants thinly and soak in salt water to prevent them from turning dark. Prepare salt water by adding a teaspoon of salt to 3 cups of water. Add the garlic, shallot and pepper mixture to the pork. Squeeze the water out from the sliced eggplants and add to the pork. Mix well, you may want to use your hand to massage the seasonings in. At this point, you might want to add fish sauce if needed. 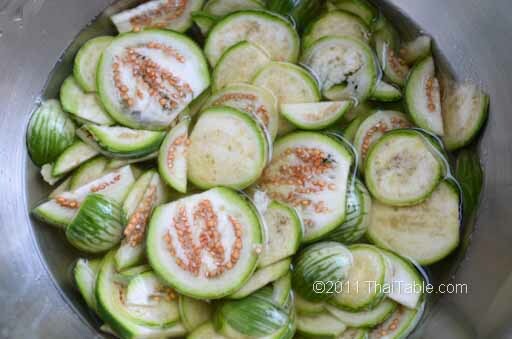 You want the flavor to be strong because the juice that drains out from the sliced eggplant dilutes your seasonings. Sprinkle with chopped green onion and cilantro. Serve with sticky rice.